Rascovar: Did Gansler lose it or Brown win it? Did Lt. Gov. 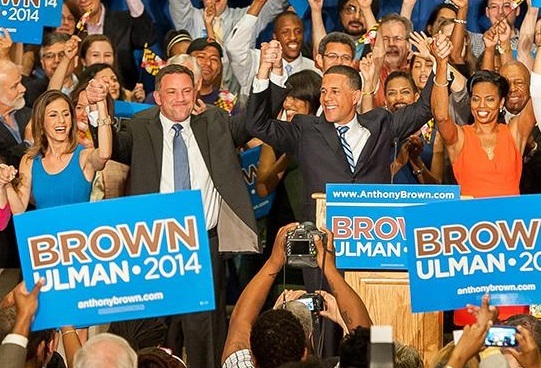 Anthony Brown run such a flawless Rose Garden campaign that his victory in Maryland’s June 24 Democratic gubernatorial primary was inevitable? Or did his chief rival, Attorney General Doug Gansler, lose the election with an ineffective campaign that badly missed the mark? As is usually the case, a combination of factors from both camps contributed to the outcome. Neither candidate proved a sensation with voters. The only spark came from the third Democrat, the ultra-liberal Heather Mizeur. Her clarity and sharp focus on issues appealing to younger voters helped her top the 20 percent barrier. It was more than enough to cost Gansler any hope of catching Brown. Brown’s staff effectively wrapped him in a tight cocoon, denying the media unfettered access for fear Brown might have an ” ‘Hispanish’ moment” (remember that flub by gubernatorial contender Kathleen Kennedy Townsend?). This Imperial Guard mentality might prove a detriment in the two-candidate general election race against Republican pragmatist Larry Hogan Jr. Yet with virtually the entire Democratic Party establishment behind him, Brown had to stumble badly to lose the primary. His rock-solid support among African-American voters gave him an unprecedented advantage. With Del. Heather Mizeur in back at a Maryland Public Television debate. Still, there were enough discontented voters that this should have been a much closer primary. Gansler, though, tripped himself up early. He never delivered a compelling, visionary message that excited Democrats. He turned into a “me, too” candidate, trying not to offend Mizeur supporters or Democrats who generally liked what O’Malley and Brown have achieved. While Brown promised to continue O’Malley’s progressivism, and Mizeur promised a radically different tomorrow, Gansler never effectively articulated how his election would improve life for John and Joan Q. Voter. The Democratic electorate was left with three unappealing choices. Brown proved the most palatable. It was the weakest set of Democratic gubernatorial candidates in memory. No one has ever captured the Democratic nomination in Maryland with such a slim political resume — and radical ideas — as Mizeur’s. No attorney general has captured the governorship in 68 years. Voters recognize that running the equivalent of a big law firm doesn’t train you for the state’s most important job. Brown has been lieutenant governor for nearly eight years, with little in the way of accomplishments. It’s a grand-sounding job that carries no official duties. To his credit, he served a year in Iraq as a member of the Army Reserve — but as a lawyer. Not exactly the sort of activity that comes with action photos. After college, he served six years on active military duty as a helicopter pilot. Not the sort of training that prepares you to run state government. He served eight years in the General Assembly — like Mizeur — with a small list of achievements, also similar to Mizeur. It’s not nearly enough legislative seasoning to impress anyone. Brown is lucky that his November foe, Larry Hogan Jr., a successful land developer, has zero elective experience. Hogan’s political resume fills a single line — a minor appointed post in the Ehrlich administration finding people willing to serve on boards and commissions. No wonder turnout was appallingly light on primary day. Brown owes his victory mainly to O’Malley’s hard work over eight years — a solid record guiding Maryland through a terrible recession while implementing a raft of dramatic reforms. Democrats are generally satisfied, as Gansler discovered. He could have made the primary interesting had not Mizeur split the “anti” vote. He never found his rhythm, though, and never connected with voters. Brown ran on O’Malley’s State House deeds, his broad Democratic establishment support and those overwhelming vote totals among African Americans. That should be more than enough to get Anthony Brown through the general election, too. You can read Barry Rascovar’s musings at www.politicalmaryland.com.